Dr. David Molden is the Director General of the International Centre for Integrated Mountain Development (ICIMOD) an organization based in Nepal dedicated to mountains and people of the Hindu Kush Himalayan (HKH) region. In his second term, David has been instrumental in positioning ICIMOD to work across eight countries as a regional organization in fields such as water resources management, climate change, resilience building, gender, ecosystem management, and information systems. During this time, ICIMOD has built its capability to generate and share knowledge, to use that knowledge to develop solutions for the HKH; and to work as a bridge between science, policy and practice. Dr Molden received a PhD in Civil Engineering from Colorado State University specializing in water resources, and has gained experience in leading transdisciplinary work across Asia and Africa. 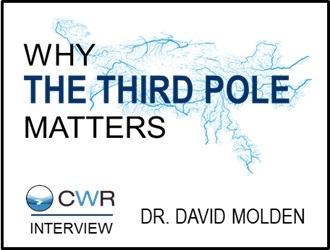 On 18 September 2018, China Water Risk launched a new report “No Water, No Growth – Does Asia have enough water to develop?” and we were honoured to have Dr. David Molden, the Director General of the International Centre for Integrated Mountain Development (ICIMOD), as one of our distinguished guests. After the launch, we got the opportunity to sit down with him to discuss more about the Hindu-Kush Himalaya (HKH) region. Why does it matter for Asia’s economy? How can we protect the region better? China Water Risk (CWR): Thank you for your expert contribution to our report and its launch. To start us off, what is the Hindu-Kush Himalayan (HKH) region? Can you briefly outline why it is so important to the future of Asia’s economy? Dr David Molden (DM): The Hindu Kush Himalayan (HKH) region extends 3,500 km over all or part of eight countries from Afghanistan in the west to Myanmar in the east. It is the source of ten large Asian river systems – the Amu Darya, Indus, Ganges, Brahmaputra (Yarlungtsanpo), Irrawaddy, Salween (Nu), Mekong (Lancang), Yangtze (Jinsha), Yellow River (Huanghe), and Tarim (Dayan), – and provides water, ecosystem services, and the basis for livelihoods to a population of around 210.5 million people in the region. Our latest analysis show that the basins of these rivers provide water to 1.9 billion people, a fifth of the world’s population. The HKH region where ICIMOD works, 760,000 km is covered by snow and 6,100 km of ice reserves. Hills and mountains, particularly the HKH mountain system, have always constituted places where adaptation, mitigation, and resilience are hallmarks of the people and the landscape they inhabit. Since time immemorial, the people of the Himalaya have maintained a rich cultural identity, and have maintained food security and biogenetic diversity within the parameters of their own tradition. The mountains and hills play a vital role in the economic growth of these HKH countries. The region’s mountains are gradually becoming ‘power-houses’ as more hydropower projects are built there to meet the region’s soaring energy demands. The Ganges, Brahmaputra and Mekong – all originating in the Himalaya – supply freshwater for agriculture, industry and meeting the needs of growing urban populations. Increasingly, the countries are beginning to realize that their rivers provide other benefits, such as sustainable use of water and land resources to enhance livelihoods for future water availability; sustaining important ecosystems; and reducing water-related disaster risks in river basins. The rivers also provide recreational services and support fisheries, augmentation of dry season flows, floods moderation and flushing of saline water, among other things. The mountains of the region host three biodiversity hotspots and harbour diverse flora and fauna – many of them rare, endemic and threatened – that support the livelihoods of its people. Similarly, the region is home to the highest nine of the world’s 14 mountains over 8,000 metres. These peaks and their scenic beauty attract thousands of tourists every year. Different religious communities revere some of the mountains in the region. The mountains also provides aesthetic and recreational services to downstream communities, particularly pleasant weather during hot summers. These services generate revenue and provide employment opportunities for communities. Mountains are crucial for many of the most pressing issues facing the HKH countries today – water, energy, food security, adaptation to climate change, and protection of biodiversity. Similarly, mountain regions also depend on lowland and coastal areas for goods and services, including connectivity, trade and transit facilities. While mountain communities depend on the plains for trade and prosperity, people from the plains depend on mountains for peace, stability and sustainability. CWR: Clearly these “water towers” of Asia are under threat from climate change and other socio-economic changes. So what do you see as the main actions needed to protect this region and ensure sustainable mountain development? DM: The lessons we take from our past experiences working in the HKH suggests that although mountain people are undergoing change, these are incremental and not sufficient to enhance the resilience of mountain communities. It is evident that despite the progress made to date on enhancing the adaptive capacities of mountain communities, concerted efforts are still needed to facilitate transformative change and resilience building for the region. The ‘water towers of Asia’ are highly sensitive to climate change, and studies have shown that the main driver of climate change is emission of Green House Gases (GHG). So, mitigation of GHG is the only long-term solution, not only within the region but globally as well. But regionally or even locally, we need to understand the climatic impact of Short Lived Climate Pollutants (SLCPs) that comes from incomplete combustion of fossil fuels and organic carbons. These pollutants heat up the atmosphere, raising temperatures thereby accelerating the melt process of snow and ice. Reducing SLCPs can have short term climate and health benefits. While mitigation is important, for the region the solutions largely lies in adapting to changes and building resilience. This includes long term overall change in behaviors, promoting environmentally friendly practices, preparing local level solution to deal with the impacts climate change cause, reducing SLCPs emissions and supporting regional governments to implement progressive laws that will help reduce their carbon footprints. At ICIMOD, we are providing evidence to support decision making in HKH countries through our research findings. We are looking at how different climatic variables and factors change with time and affect broader environmental change. We explain the impacts of climate change, and also propose based on evidences climate change adaptation strategies at various levels to respond to possible changes in the future. Our work with government and academic institutions in Nepal and Bhutan has been successful in setting up a long term cryosphere monitoring programme. More recently, we have also started collaborating with relevant agencies in Pakistan and Afghanistan. Our long term goal is to ensure that the countries in the region are actively sharing information, and using research results to design more effective development plans. CWR: You have mentioned data gaps in glacial monitoring as a key challenge for the HKH region. Could you give us an example to illustrate why? How urgent is this issue? DM: The HKH is a vast region having diverse climatic pattern. There are more than 50,000 glaciers in the region and based on their locations, all of these glaciers behave differently. At present, there are only about 10 glaciers in the region that have a monitoring record of more than 5 years. With such limited data, we cannot interpret the results with confidence to suggest likely impacts of climate change on the regional hydrological regime. For example, some glaciers in the Karakorum region are increasing in size. We are yet to know the reason behind this anomalous phenomenon and what could be the future scenario because currently we are dependent only on satellite data. We need to have more in-situ glacier monitoring including catchment glacio – hydrological monitoring. In-situ monitoring accompanied by remote sensing based glacier mass balance monitoring can provide a better picture of glacier dynamics and impacts on water resources. Also, in order to properly understand the impact of climate change on glaciers, we study precipitation patterns and temperature changes which are the two main drivers of the glacial change. We need to extend existing network of weather stations to higher altitudes which are difficult to install and maintain given the topography of the region. CWR: More specifically, what do you believe it will take, in terms of funding and resources, for a comprehensive glacial monitoring network to be set up in the HKH region? DM: This can be highly context specific. Roughly about USD 500,000 per year per site would be required to setup comprehensive catchment scale monitoring. The cost in the initial years are more due to hardware costs, but in the following years it is mostly operation, maintenance and human resource cost of the field setup. In addition, it is important to think about data management already when setting up the monitoring programme, since only collecting the data is not enough. Data have to be continuously quality controlled, processed, analyzed, safely stored and shared with the stakeholders. Ideally, different types of knowledge products serving policy makers, the public including local communities, and the scientific community should be also developed based on the data analysis. All this requires resources. Cryosphere monitoring is a highly resource intensive activity, especially in this region. It needs a multiple approach from on-site data collection, remote sensing, modeling and carrying out capacity building activities to improve number of skilled glaciologists in the region, and also collaboration with partners to establish sustainable, long term cryosphere monitoring programme. We are collaborating with national partners by contributing to strengthen capacity and providing technical backstopping. Our partners are gradually taking over on site glacier monitoring activities, but they still need support to enhance their skills in data analysis and to ensure sustainability of the monitoring work. For in situ monitoring, it would be ideal to monitor glaciers in different climatic zones and geographic settings across the entire HKH. We are yet to get there and accessing high resolution satellite image is also a challenge. CWR: As ICIMOD hosts the “First Hindu Kush Himalaya Science-Policy Forum” in Kathmandu, Nepal next month, what do you hope will come out of this event? DM: The Hindu Kush Himalayan Monitoring and Assessment Programme (HIMAP) is a long-term, integrated science-policy initiative coordinated by ICIMOD that aims to support enabling policies and sustainable solutions, and promote regional cooperation to address some of the region’s most immediate challenges. HIMAP is a platform for long-term collaboration and coordination among a broad and diverse group of more than 400 leading researchers, practitioners, and policy specialists working in the HKH. Under HIMAP, experts from the region have come together to develop the first Comprehensive Assessment of the HKH, to be launched at the first HKH Science-Policy Forum in November 2018, as the first in a series of monitoring and assessment reports. It deals with major issues such as climate change, biodiversity, energy, cryosphere (frozen water), water, food security, air pollution, disaster and resilience, poverty, adaptation, gender, and migration. Through a series of HKH Science-Policy Forums, the key findings and main messages of HIMAP will be shared with a larger audience with the aim of building momentum for more robust regional cooperation for mountains, environments and livelihoods, and a roadmap for implementing the nine SDG-consistent mountain priorities. Build agreement on establishing the forum as a regular annual feature for dialogue on regional cooperation. CWR: Last but not least, how optimistic are you regarding the future of the HKH region? What is ICIMOD’s role going forward? DM: ICIMOD plays a unique role in the region as a meeting place for ideas, dialogue, and collaborative action. As new challenges emerge and existing ones become more complex in the face of change, the need for regional cooperation to create sustainable development outcomes will continue to grow. Our regional niche and ability to bring countries in the region together to address shared challenges and work toward common goals will become an even more valuable asset in our mission to improve the lives and livelihoods of mountain men, women, and children of the Hindu Kush Himalaya. One of ICIMOD’s greatest strengths is its ability to bring people together to tackle the region’s shared challenges. We have many examples of how we have brought practitioners, mountain communities, and policy makers together. None of this would be possible without the support of our partners and supporters like you, and I would like to thank you for joining us on ICIMOD’s mission to create safer, healthier lives for mountains and people in the HKH. Given the dynamic nature of the people in the mountain and Asia, I am optimistic that we will rise to the challenge to ensure a sustainable and prosperous HKH.